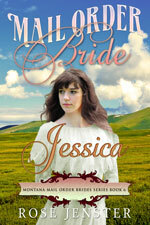 Mail Order Bride Jessica is now released and is a sweet novella about a young lady who tried to protect her friend from disgrace. She ended up herself having her reputation damaged due to a misunderstanding! Jessica does not want to go to England to due to the town’s gossip which is her mother’s idea. She does not want to marry there and have to live a new life where she’d be alienated. The truth of the matter is that Jessica was not a “high society” type internally in many ways. She loved missing the tea parties and preferred to drink tea and have her treats curled up with a good book. What happens when she decides to answer a mail order bride advertisement from a Montana man? It’s available now at Amazon and you can find it by clicking here . I hope you didn’t have the negative consequences that unfairly happened to Jessica! I think kindness has a happy ending even if the road is rough for a while. Thank you for reading the books and letting your kids and grandchildren know that there are good people in this world and stories with happy endings that are uplifting! Jessica is so sweet She sacrificed so much and she was such a good friend to someone who doesn’t deserve it! i have done things like that myself and really identify with her. Thank you Rose Jenster for making her story so deep and real! Love all your books!!! A retired fan who has her granddaughter reading the books too!